We're not quite there yet, but fall is approaching. While it is a beautiful time of year and one that both you and your dog can enjoy, there's a fresh set of challenges and hazards for you to be aware of and protect your dog from. Once fall has well and truly arrived, you will notice the days (and nights) become a great deal cooler, so while you start to put on your extra layers, the same should be done for your dog. If you don't already have one, you should consider purchasing a dog coat, especially if you have a smooth or single coated breed. Make sure it's water resistant, lined and is adjustable. Fall is when snakes get ready to hibernate and are also more likely to bite at this time of year. Educate yourself on what snakes are known to slither around your area, in particular poisonous varieties so you can stay away from their usual locations. Did you know that mothballs are toxic to dogs if eaten? Be extra cautious when bringing out your winter woolies after being tucked away in your wardrobe for a long time. Fall is the time of year people are most likely to change their engine coolant. Look to see if the variety you use is ethylene glycol based as this is toxic to dogs. If you can, change brands to one that is propylene glycol based because if accidentally ingested it is less toxic. In any case, make sure any spillages are immediately cleaned up. Mushrooms are delicious to eat and are the perfect addition to any fall-time meal. However, while 99% of mushrooms are perfectly harmless, there is still 1% that are incredibly toxic, so make sure when you are out and about you keep your dog away from all mushrooms to be on the safe side. If your dog does eat a mushroom, contact your vet immediately. Fall is also the time that many people choose to use rodenticides to deter rodents from coming into their home. If you are a pet owner, you must be extra vigilant because these are incredibly toxic to dogs - so if you are determined to use rodenticide, be careful to not put it in places where your dog can reach - or seek out safer alternatives. If your dog spends a lot, if not all of its time outdoors you will have to prepare them to face the impending cold temperatures. Make sure they have a warm and dry shelter to protect them from the elements. Be sure to include extra blankets and bedding. Consider including cedar shavings into the mix because they provide great insulation. It's a common belief that during the cooler months outdoor dogs should be fed more food to keep them warm, however this is not often the case. If your dog is particularly active, then you could consider giving them a bit more at meal time, but no more than a 10% increase. This also doesn't mean you can go crazy with the snacks! Fall can be quite a wet and muddy time of year so make sure you are prepared for the extra washing and grooming you may be required to do. Have extra towels in your car to absorb excess water and you could even invest in a waterless shampoo, so you can keep your dog squeaky clean without the hassle of a bath. While we love fall because we can indulge in some of our favourite comfort foods, be aware that many of the things we love to eat can be toxic to dogs and make them sick. Chocolate is particularly dangerous so make sure none is in reach. As tempting as it may be don't get into the habit of sneaking your dog left overs from your dinner plate, because while they are not toxic they are not good for your dog's health and can cause intestinal upsets and diarrhea. If you want to give your pooch a seasonal treat, pumpkin is a good option to consider. It may be getting cooler, but that doesn't mean fleas and ticks are no longer a problem. Make sure you keep on top of your usual flea and tick treatments. Conkers are a true symbol that fall has arrived. They are so very dangerous for your dog and are highly toxic if they are chewed or eaten and can cause serious blockages internally. The same applies for daffodil or tulip bulbs, so gardeners beware! 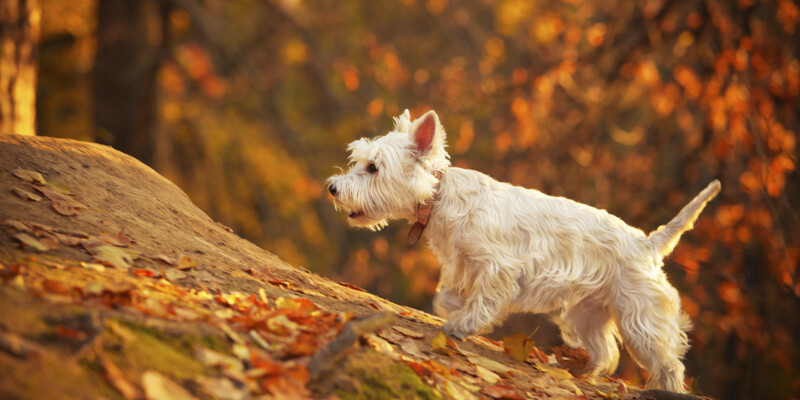 Like humans, the changing seasons can set allergies off for dogs. If your dog develops a skin rash, starts sneezing or has clear discharge coming from their nose, it's likely they are feeling the effects of an allergy. Take your dog to the vet so medicine such as antihistamines can be prescribed. They're bright, fun and festive but in the wrong paws can be quite dangerous. Be aware of leaving any decorative objects around that your dog could munch on - otherwise there will be a trip to the vet.